Hand Readings of famous people: Amy Winehouse - did she have suicidal tendencies? Amy Winehouse - did she have suicidal tendencies? A lot has been written about celebs and suicidal behaviour. Experts have suggested that the very quality that makes a person strive for fame (self-obsession) could be a factor in their suicidal tendencies, perhaps if life does not go according to plan. It is suspected that Robin Williams was adversely affected by the diagnosis of Parkinson’s, more affected than an average person would be. This self-obsession is bound to exist amongst ordinary people as well because after all everyone is ordinary until they achieve fame! And more people fail to achieve world-wide fame rather than succeed at it. have the resources to battle depression. And who is to say that famous people are self-obsessive? Coming to Amy Winehouse’s hand, there is nothing extraordinary in the hand shape but there is a disproportionate development of the lower side of the mount of Luna or Moon and a headline plunging straight downwards. This itself tells a story, and it was lucky to get such a clear picture of her hand. Check out the hand photograph here. There appears to be a Girdle of Venus present on her hand as well, and there is a line joining the heart and headlines. Then there are those sensitive pads on the tips of her fingers, a slightly thick top phalange of the thumb, fingertips which are slightly conic in shape and a slightly bent little finger. These features in combination do not show a balanced hand. Such a hand shows a person who is very imaginative and creative, but secretive, and with a dark side and also very emotionally sensitive. It shows a person who lives in her own world, and it also shows a lack of self-control and obsessive behaviour. It is not at all surprising that Amy Winehouse had problems – she died of alcohol poisoning. Her addictions were certainly self-destructive, and some would go so far as to call them suicidal, although there is no evidence that she committed suicide. One cannot help but wonder that if a person such as Amy had not been successful, but had remained ordinary and middle-class even after years of struggle, would she have met the same fate? Would she have had access to so much alcohol and luxurious, private accommodation? Wouldn't she have listened more to those who loved her if she had been a failure? Wouldn't she have been more emotionally dependent on them? One will never know, although a good picture of her passive left hand will help in understanding how fame changed her. Two singers who committed suicide: Chester Bennington and Kurt Cobain and these two posts could give you a clue as to why they did so. 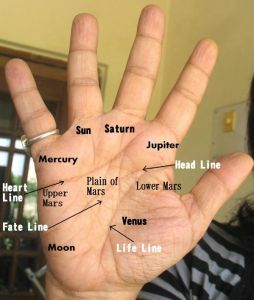 You might also like the hand readings of other singers: Hand Reading of Lady Gaga, the Hand Reading of Miley Cyrus or Rihanna's hand reading or Hand Reading of Jennifer Lopez or The hand analysis of music star Maddona. Or Is Justin Beiber as innocent as he looks? Or check out the hand analysis of other musicians and singers under the label of "Music Stars" or check out the hand readings of Hollywood actors. Sometimes, failure and not-being-famous is as important. Especially to people who can't handle success and fame! I think depression is a natural process for the body to realize the potency of its biological set up and gauge a sense of time and space around them …to take necessary and appropriate timely actions and gain a reality check when most of us wuld rather deviate from a set path..i think evolutionary it also comes from a large group of factors which r mainly concerned to make human life instilled with objectives goals ambition..and if any psyche is not exercising these attributes to the degree that it should in any normal human capacity it can affect us..unfortunately most of us don’t function that way..although we realize the gravity of the situation …and the significance of human existence most of us live seemingly tired redundant….meaning less lives..and the modern lifestyle doesn’t help either.but then what does a person do here..the more highly intelligent and sensitive the person becomes he /she is inspired to take higher..risks to change the paradigm..not that the less intelligent people r not aware but they might always struglle 8 out of 10 times …and be absolutely clueless. ..which can be overbearing at times to the extent that in some cases can lead people to drugs alcohol or just feeling generally hopeless…ill be honest here I still don’t have any right sense of knowledge of how intensely it can lead people to the extent of commiting suicide ..and I can hardly imagine what robin must have went through…but it’s a crude shock ..especially if u realize the extent of his talent largely came from this highly volatile constantly seeking curious mind.which could produce mind boggling references..impressions at blinding speeds…if u ever been a fan u wuld have known..i was fascinated by this guy for so many years..to be honest to function in a way robin did and so many other artists who have this massive reservoir of imagination they can indeed lose a sense of reality..u need to be detached from worldly scenarios.. the idiosyncrasies that people indulge in being oblivious to most of the time. (courtesy heavy moon mount .. very sharp mercury line and a sloping head line )Its heartbreaking and because I have experienced my share of struggle with this phenomenon ..and still do at times…because it does make u paralyze..although I realize the only reason I am experiencing it is because I don’t want to live a regular pragmatic systematic..routine..life..and I always seem to revert back ..its a constant struggle..and quite frankly a very weird…one..where the mind in some sense suddenly becomes dedicated intrinsically to destroy the natural functioning of the human body and go involuntarily against..our commands.